Author Question: How Long to Drown to Death? I’m a fan of your blog and was hoping you could help me. My current work in progress has a seven-year-old girl die from drowning. After the rest of her family goes inside, she returns back to the pool to retrieve something and then is found minutes later. 2. 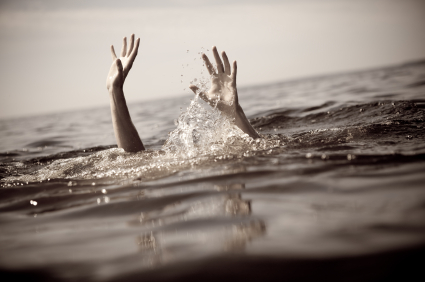 Physically, what exactly happens when a person drowns? I’m assuming there is a lot more to it than just the lungs filling with water. For example, what would an autopsy show to prove that it was a drowning? I had prepared this post to run long before I got a phone call from a good friend who also happens to be an ER nurse and mother of seven. I don’t know what it is about kids and water– but it draws them like a moth to a flame. I think personal accounts of situations are good for us to read through as writers because it gives us a glimpse of what it’s like to have a moment in another person’s shoes. My friend’s young son drowned and was subsequently revived with no neurological deficits. This is a MIRACLE and you can read her first hand account of this event here. Part one of your question– first thing you need to determine is does she fall into the water unconscious? If so– she will drown quicker. Versus, if she falls into the water conscious– she will struggle in the water (you can determine this) before succumbing to the water based upon her ability to swim. Maybe this struggling lasts for 2-3 minutes, then she goes unconscious. When she goes unconscious, the water will flow into her lungs. When water is in the lungs– there can no longer be gas exchange. When there is no longer gas exchange, the organs begin to die from lack of oxygen. The most common time frame you’ll hear for “brain death” to occur is four minutes. Now, it would not be all that unusual to revive her at some point after four minutes. We may get a return of her pulse but her brain likely will be past the point of return. So, upon finding her down in the pool, say after 10 minutes of someone last seeing her, you could just have them be unable to revive her at all. That would probably be the easiest way to deal with it. She would likely still be transported to the hospital and worked on because she is a child and pronounced dead at the hospital. If she is revived– that’s a whole other can of worms you may not want to go into. As far as what the autopsy would show– this is an excellent resource I think you should read through. I think it has a lot of what you’re looking for. Kara Hunt is an inspirational speaker and writer who throughout the years has mentored women on the various aspects of living daily and triumphantly as women of God, despite their past and regardless of their circumstances. Kara’s transparent testimony touches hearts and has helped many women reconnect and refocus on what’s truly important during their spiritual journeys. As Kara ministers out of her own personal experiences, she desires to communicate God’s truth as He reveals it, and wants other women to know that they too can experience God’s merciful and unspeakable joy.